Learn the apple and bananas of food combining for enhanced stress relief teamed with disease prevention and simple carefree ways to detox your body without sweating. Looking for a great way aid stress relief, get on disease prevention in your youth, and detox your body without having to take a tiresome sauna bath, then you need Japanese food combination recipes to make it right. Food combining has a strong negative image because of potentially harmfulbad food combination out there such as bananas and milk said to make your body feel heavy slowing down the mind. In Japan food combinations also known as tabeawase such as eel and dried plum, and watermelon and tempura have been thought as a form of bad food combining that become known from centuries of trial and error. What are the best foods to eat together? There are food combinations that increase the nutrient absorption in your meal. Applying food combination to increase the nutrient absorption of the foods you eat is the foundation of food combining allowing more efficient absorption of nutrients into your body. In this episode of Slism, we will touch on some great food combinations borrowed from the Japanese diet to send you on your way to more diet-friendly healthy eating to start dieting smarter. For anyone who has ever tried to lose weight going on a diet, getting stressed out by external factor such as dietary restriction, muscle soreness, and failure to meet ones expectations are a given that all people have to deal with some day or another. You would be surprised how even subtle changes to your lifestyle can turn into a major factor contributing to stress. It turns out that when you don't get enough calcium in your diet, you are more likely to be stressed and develop osteoporosis later in life than others who get adequate amounts of calcium in their diet. However, that doesn't mean you should splurge to get more calcium. 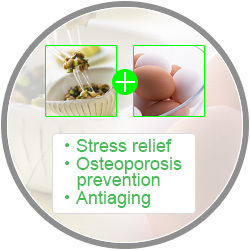 What your body needs to absorb more calcium is vitamin D.
By food combining fermented soybeans (that's Natto in Japanese) that contains calcium with eggs high in vitamin D, you do both give your body the calcium it to battle stress and prevent osteoporosis with added efficiency through vitamin D. Natto and eggs is a great food combination to aid your body in the nutrient absorption of calcium while making it easy to deal with stress. Natto and eggs both contain large amounts of vitamin B2 that is said to help when converting fat into energy your body can use to boost your fat metabolism. That is why vitamin B2 is thought to be a nutrient indispensable to your diet when trying to lose fat. In addition, eggs are an excellent source of vitamin A and vitamin E that when combined produce an antiaging effect to keep you looking young longer. Moreover, vitamin B2 found in Natto aids in beta-oxidation of fatty acids, an added plus to your anti-aging solution and ever youthful appearance. The synergy between boosting your fat metabolism and the benefits of antiaging is what makes food combining with Natto and Eggs so exiting for your health and beauty. What seems obvious in most Italian cuisine is the food combination of tomato and olive oil which begs to be asking why food combinations like this taste so good in the mouth while keeping their promise inside the body. You may have heard the following saying. What this means is that tomatoes are a food high nutritional value. Packed with so much vitamins and mineral you have nothing to lose by eating this succulent food item. Recently tomatoes have been found to contain lycopene that is said prevent lifestyle diseases + promote antiaging + and slow down cancer causing cells in your body. When you are on a diet looking to hold back on your fat intake you might not want to do food combining with olive oil, after all it is fat. That may be one reason why you would stick to eating plain tomatoes, but that's not all. Lycopene is fat soluble. 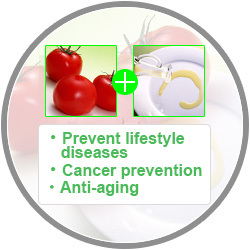 What this means is in order to increase the chances that lycopene enters your system combining olive oil with tomatoes is key. In addition to containing the supper nutrient lycopene, tomatoes contain vitamin A (also fat soluble) which means you are going to need olive oil to make this food combination work even more. The main ingredient of olive oil is the unsaturated fatty acid oleic acid. Oleic acid is said to not only prevent lifestyle diseases but also reduces the chance of developing circulatory organ related diseases. In addition to helping your prevent life threatening diseases later in life, olive oil contains polyphenol and vitamin E powerful antioxidants that are said to have an antiaging effect on your body. Find out more great health benefits you can get by simply drinking olive oil daily for times when you are out of tomatoes or just aren't up for a salad to help suppress appetite between meals. By food combining bamboo shoots rich in dietary fiber with chlorophyll rich spinach you have a solution to get rid of dioxin and food additives potentially harmful to your body. 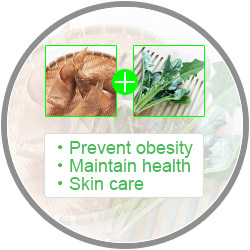 Yes, this food combination allows detox your body naturally in only two ingredients. Behind the scenes whether you are ready to admit it or not, toxins are building up in your body and even starting to change the color of your feet. That's right! The first place toxin build up in your body is your feet making an appearance in the color of your toe nails and around your feet. Luckily enough, you have dietary fiber food combined with chlorophyll to so scoop up toxin before it's too late. Another place toxin buildup in your body affects the functions of enzymes in your body lowering your immune system increase you chance of developing obtuse obesity not to mention the horror it does to your once beautiful skin. There are all kinds of ways you can detox your body including taking a stone sauna bath or giving yourself a hip bath where you only bath the lower half of your body to detox without the exhaustion of taking a half bath. By taking products to detox your body from inside you can cleanse without breaking a sweat. But with food combination of bamboo sprouts and spinach you can do it at home saving you money you can spend on other things. The Dietary Fiber In Bamboo Shoots Can Prevent Overeating! Bamboo shoots contain large amounts of insoluble dietary fiber that expand absorbing fluids in your stomach making it easier to get full and satisfy your appetite. Not only do bamboo shoots give you insoluble dietary fiber to feel less hungry, it can help relieve constipation and release extra sodium from your body. Not matter how good something is for your body, there are limits to how for you can stretch living on only one type of food for long periods of time. That is why when you are on diet you shouldn't make sudden alterations such as changing your daily food intake deciding to eat only one type of food, hence the apple diet. Doing this only begs malnutrition in your diet. As long as you keep eating balanced healthy meals in your heart there should be little reason to worry about missing out on nutrient absorption, after all your body is a machine built for survival during the good times and the hard alike. On the other hand if you feel like you are not getting the best out of the nutrients you are putting into your body, then you should really turn food combining into the backbone driving your diet. Trouble lately with detoxing your body? 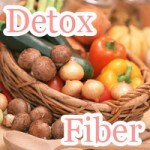 Maybe you are not getting enough detox fibers in your diet. If you here are the foods you need to pick up next at the grocery store. Sometimes one-plus-one doesn't come out to 2. The reason has to do with how your body digests food. 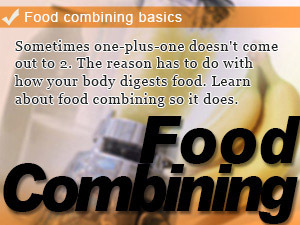 Learn about food combining so it does. Don't let your body control the nutrient absorption of the foods you eat. You are better than that. 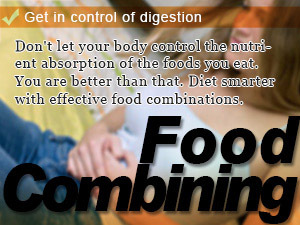 Diet smarter with effective food combinations. 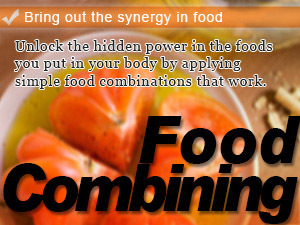 Unlock the hidden power in the foods you put in your body by applying simple food combinations that work.